Children enrolled at Children's Garden Nursery School are 2-5 years old with half day programs offered in Toddler, Nursery and Kindergarten with small child to teacher ratios. French, drama, music and sportball are provided on a weekly schedule. The primary purpose of Children's Garden Nursery School is to provide the community with a program that responds to not only the intellectual and physical needs, but also to the emotional and social needs of the developing child. The school functions in the spirit of a family - a home away from home where children feel happy and comfortable. 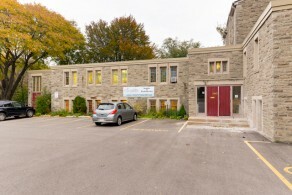 Maria Montessori School was founded in 1975 and for more than thirty years, has operated at the same location in North Toronto. In 1988 an elementary program for children between the ages of six and twelve was established seeing its first graduation in 1994. Currently the school supports a young children's community (toddler), two Casa and two Elementary communities with a total enrolment of approximately one hundred and twenty five children. Utilizing the framework of the Montessori principles and philosophy, the school provides each child the opportunity to develop their abilities to their fullest potential within a safe, loving and affirming environment. The staff are experienced and dedicated Montessori Educators committed to aiding and nurturing the development of the whole child. This, together with adherence to the fundamental principles set forth by Dr. Montessori, and an informed, active and caring parent body, creates an affirming, purposeful and harmonious atmosphere within which children work, play and grow. 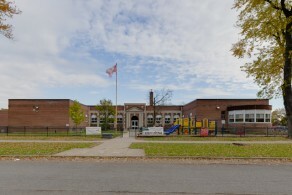 Northlea Elementary Middle School is a dual track school from Junior Kindergarten through to Grade 8. French Immersion is offered in Senior Kindergarten through Grade 8. Except for language arts, the French Immersion curriculum is the same as the English curriculum. Formal English instruction begins in Grade 4. The English program is offered for all grades and French instruction begins in Grade 4 for the English track. There are three divisions: 1) Primary: JK to Grade 3, 2) Junior: Grades 4 – 6, 3) Intermediate: Grades 7 and 8. Other programs include library, special education, vocal music, instrumental music and physical education. Children’s Garden School has been providing exceptional private school programming for 25 years. They are located on Eglinton and provide programming from Preschool through Grade 3. At CGS they believe that children learn best when they are in a secure and nurturing environment. They are committed to small class sizes and believe that low student to teacher ratios lead to the greatest success for young children. The early years are a critical and exciting time in the education of your child and it is a time when students need plenty of consistent encouragement and guidance to thrive socially and academically. Leaside High School is a school of between 900 and 1000 pupils in central-east Toronto at the corner of Eglinton and Bayview Avenues. 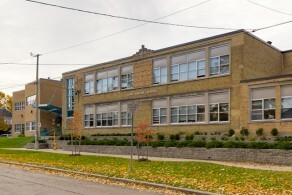 Established in 1945, the school is part of the Leaside community of East York. The school has science, computer science and classics programs. Leaside currently features a highly touted French Immersion program. 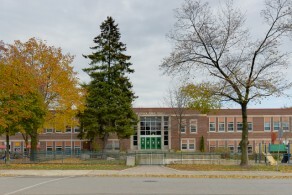 Feeder schools for Leaside High School include Bessborough Public School and Northlea Public School. 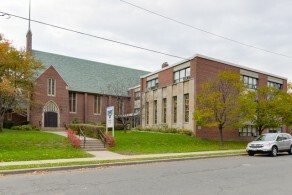 The school houses the French Immersion program, from Cosburn Middle School and Northlea E.M.S. In late 2006, Leaside High was rated "Best Toronto School for Languages" by Toronto Life Magazine. 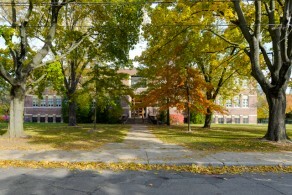 In 1999 the school was used in the music video for Canadian pop group Len and their song Feelin' Alright. 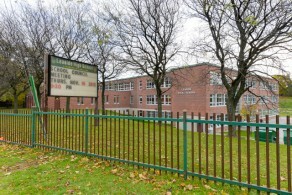 Bessborough is a JK to grade 8 school located in the Leaside area of Toronto. It was the first public school in Leaside and at one point the Town Hall. Bessborough is a dynamic neighbourhood school with a tradition of academic excellence. Active and involved parents participate in the daily lives of their children. Students who join school in Grades 7 and 8 from Rolph Road and Bennington Heights Public Schools take part in specialty programs in vocal and instrumental music, visual arts, computers, drama, physical education, and science and technology. 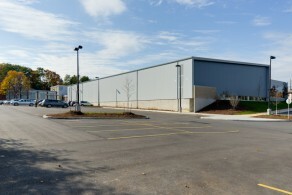 School facilities include two gymnasiums, a music room, a computer lab, art rooms, a clay room, and two science labs. The school houses the Bessborough Child Care Centre and also serves as a community centre for various local groups and agencies. St Anselm, named after St. Anselm, Archbishop of Canterbury, is a small school of approximately 350 students located in the Leaside area of Toronto. It’s philosophy is based on the fundamental principle of fostering feelings of self-worth in their students. St. Anselm takes pride in their school. Staff expect that all students will participate in the school community, assume responsibility for their actions, show initiative, conduct themselves with dignity and demonstrate consideration for our environment. St. Anselm School provides a learning environment, with models of Gospel values and Catholic doctrines, teachings and beliefs are an integral part of the daily life of the school. With the rapid growth of Leaside’s population, the need for a second public school became obvious. 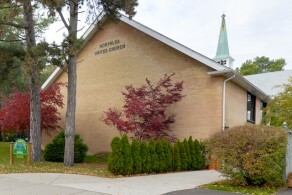 Land between Hanna Road and Rolph Road just south of Sutherland Drive, was purchased on November 12, 1938 and Rolph Road Public School was officially opened in October 1939. The school was named after Dr. John Rolph, a pioneer in medical education. The school emphasizes the importance of students, families, educators and community members working together to create an educational environment that is safe and caring and strives for academic excellence. The belief that every student they teach will be successful, wherever their goals take them in their future is integral to the school culture. Being a part of Rolph Road is a special opportunity; they have a strong community with caring and involved .The teachers are committed to providing a solid educational experience with a variety of learning opportunities for all students. This is not just any two-acre spread of green space, it is home to a feature that is unique in all of Canada. A closer look at the elements of the skateboard portion of Leonard Linton Park, reveals something known as a dome or cradle, which designers say is getting attention internationally. There are also a couple basketball courts. Serena Gundy Park was named after the first wife of the late James H. Gundy, owner of a 20-hectare private estate and president of the large securities dealer Wood Gundy Limited. 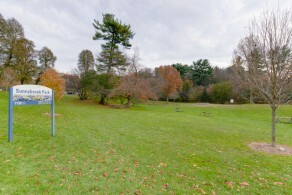 The parkland was donated by the Gundy Estate in March 1960, on the understanding that $200,000 would be spent during a ten-year period on park improvements and that a suitable memorial, approved by the trustees of the estate, would be erected. A bronze plaque built into the stone gates at the Broadway Avenue entrance honours this generous gift. It is a 0.7km trail for walking/hiking, running, cycling, with rest stops and picnic areas with washrooms and parking available. Sunnybrook Farm was the 154-hectare country estate of Joseph Kilgour in the late 1800s. 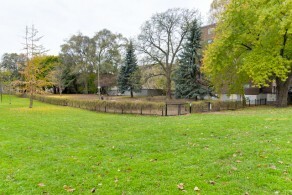 It is located north of Leaside and south of the Bridle Path areas of the city. After Kilgour's passing, his wife Alice donated Sunnybrook Farms to the city in 1928 to be used as a park. 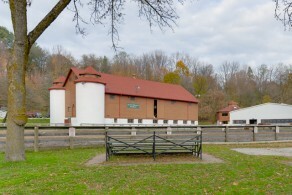 The Kilgour barns were preserved and currently serve as a public riding school. The Metropolitan Police stabled here up until their move down to the stables at Exhibition Place in 2005. The park is home to many bike trails, dog parks, and Sunnybrook Stables with the fields now used for sports and recreation. 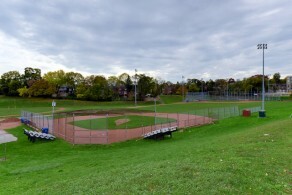 A 4.9 hectare park near Bayview Ave and Eglinton Ave East featuring two ball diamonds including one with lights, a multi-purpose sports field and track, two outdoor tennis courts, a splash pad and children's playground. Located at the east end of the park is the Leaside Lawn Bowling Club. Formerly known as Bayview/Moore, this one hectare park features a children's playground and a dog off-leash area surrounded by an open grassy area and trees. 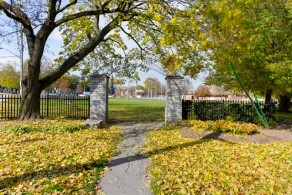 Also known as Leaside Gardens, is A facility built by the community, operated by the community and for the community. 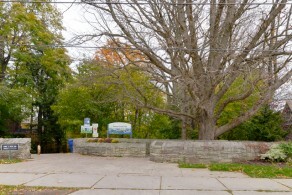 Leaside Memorial Community Gardens has been a focal point in the Leaside and surrounding neighbourhoods for more than 50 years. The arena opened its doors 1951 at the intersection of Millwood and Laird Drive. In addition to the two ice rink pads, one which is brand new, the facility also includes a banquet room, the William Lea Room, and a pool operated on a cost-recovery basis pursuant to an agreement with the City of Toronto. 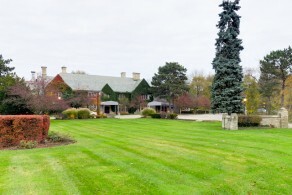 This is one of the Estates of Sunnybrook located around the Sunnybrook Health Sciences Centre. The Vaughan Estate, originally known as Donningvale, was built in 1931 as a family home for John James Vaughan, Vice President of the T. Eaton Company. The house was designed by architects Burden and Gouinlock in a simple Elizabethan style; typical of a large country manor. The home is sumptuously appointed with massive fireplaces, intricate cornice moldings, carved plaster ceilings, and leaded casement windows with gracefully curved handles. The grandeur continues throughout with beautiful walkouts onto a series of tiered patios, gardens and stone pathways all overlooking the extensive grounds and the Don River Ravine.. Its restoration came in 1991 when six interior designers donated their time and talent to renovating and revitalizing the home. After the death of Vaughan, his estate was also used as a clinical facility for the Sunnybrook Health Science Centre and now, along with its neighbour, The McLean House, it provides a stunning backdrop for private social and corporate events. 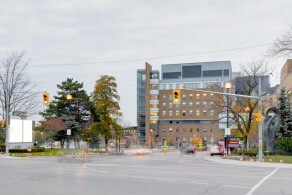 Sunnybrook Health Sciences Centre, abbreviated SHSC and known simply as Sunnybrook, is an academic health sciences centre located in Toronto, Ontario. It is the largest trauma centre in Canada and is one of the two major trauma centres in the GTA. It offers comprehensive care and is a national leader in image-guided therapies.It is one of the fastest growing hospitals in North America, and is the nation's largest maternity hospital with the new Women & Babies Program, which opened on September 12, 2010. Sunnybrook is home to the Edmond Odette Regional Cancer Centre and the Schulich Heart Centre, both national leaders in their respective areas of medicine. In October 2008, Sunnybrook was named one of Greater Toronto's Top Employers by Mediacorp Canada Inc. The Kilgour Wing (K Wing) is a long-term care centre housing a large majority of World War II veterans. Set in a spacious park in a quiet residential area, Trace Manes CC provides local programming for families. Rooms are suitable for small meetings and quiet activities. 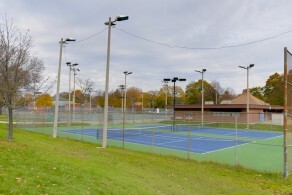 Tennis activities are community-operated by the Leaside Tennis Club. 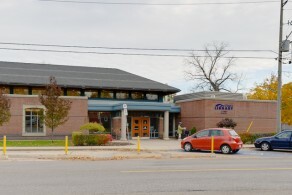 The Leaside Library opened in 1943 and is located alongside with the Trace Manes Community Centre and Trace Manes Park which is the main park area in the neighbourhood. There is a lot of available parking Monday thru Saturday and accessible by public transit. There is a 24 hour book drop, art exhibit space, computers with Microsoft programs and internet available. Seating for 75 in the auditorium section of the facility is available for lectures. 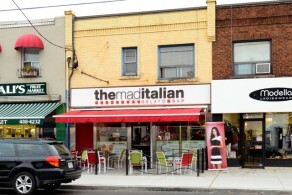 Leaside’s The Mad Italian Gelato Bar features 24 flavours of homemade gelato. Also available is European coffee and cappuccino and assorted pastries made daily. Flavours include sugar-free hazelnut, pistachio, banana, wild berry and milk-free dark chocolate. McSorley’s Saloon has been serving Toronto’s Leaside neighbourhood for more than 20 years. This cheerful and upbeat sports bar is always up for a party. McSorley’s offers a number of platters made up of pub classics such as chicken wings, bruchetta, pizza, and veggies, which are served until the early morning hours. This neighbourhood staple can accommodate parties of up to fifty people in its casual dining space. 15 HD TVs found throughout the room and the nearly 20 beers on tap, make McSorley’s a popular spot to catch a game. There’s also a street side patio where guests can enjoy the pub’s nightly specials. Amaya the Indian Room specializes in North Indian cuisine, such as traditional curry dishes, Chicken Tikka and freshly baked Naan bread. Amaya’s aromatic menu is a treat for the senses.. Chef Dinesh Singh Butola is at the helm of the kitchen, making an array of specialities beyond the familiar including harra kebab fritters, savoury chaat, patrani machchi and murgh satrangi. The 40-seat restaurant is decorated with the flavours of India including original photos that create a casual and elegant atmosphere. 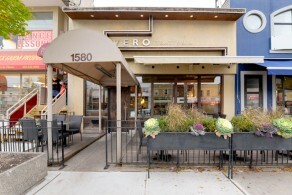 The owners at Vero Trattoria come from Bar Italia, bringing their expertise in authentic Italian fare to this slightly upscale restaurant. The restaurant serves fresh, moderately priced pizzas, pastas and salads for lunch and dinner, while frittatas, omelettes, French toast, and paninis are made for brunch. Vero Trattoria is also fully licensed, offering an extensive wine list to be enjoyed inside the restaurant’s cozy dining room. And though seating space opens up during the warmer nights with the restaurant’s covered street side patio, reservations are recommended in the evening for this bustling destination, Appropriate for couples, families, and corporate dining. 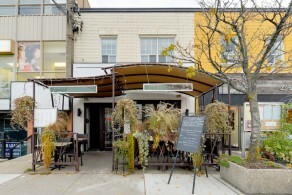 This Italian destination is located in Toronto’s Leaside neighbourhood, serving a range of Italian favourites. In additional to a variety of pastas, Verdi Trattoria’s menu offers antipasti and seafood dishes, more than 15 varieties of pizza,with a long list of toppings for inventive patrons who prefer to build their own custom creations. Verdi Trattoria is fully licensed with a bar at the back of the restaurant’s long, narrow dining room,. Appropriate for a range of functions, whether it’s a family dinner or date night. The restaurant is casual yet elegant, and its soft lighting creates a warm and inviting ambiance. 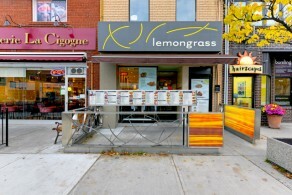 Out front, it also has a number of small tables on their covered patio. But regardless of space, reservations are recommended for dining at Verdi Trattoria. 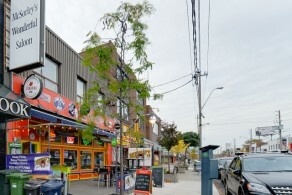 Mexico Lindo is a casual restaurant, serving the city’s Leaside neighbourhood. Items on the menu are mix of authentic Mexican,and Tex-Mex classics with a few of the chef’s original creations, many of which are brought to the table on steaming hot plates. 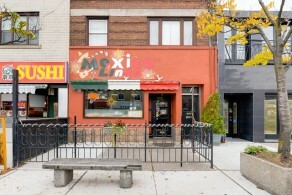 A neighbourhood favourite open every day for lunch and dinner until 9 p.m. Mexico Lindo does offer takeout, however, the restaurant also provides seating space both indoors and on a street side patio. The outside décor is very festive, and the small storefront opens up to a fair-sized and dimly lit dining room, which has a relaxed and casual atmosphere. 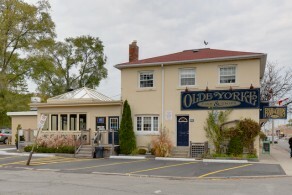 Located on Laird Drive in Toronto’s Leaside neighbourhood, Olde Yorke is a neighbourhood pub with a historic feel. The dining room is filled with dark wood, vintage carpeting, a long bar, and a number of deep red vinyl booths. While it may resemble a number of other traditional pubs found across the city, the main draw at Olde Yorke isn’t the nachos. For more than a decade, the restaurant has specialized in fish & chips. Along with this traditional British dish, the pub serves a number of other seafood staples, such as calamari and clam chowder. Although Olde Yorke is a popular eat-in spot, the pub also provides a takeout counter that’s also quite busy during peak hours. Lemongrass Restaurant serves an exotic blend of Asian cuisines including Thai, Vietnamese, Indian, Japanese, Chinese and Malaysian. This is a restaurant for anyone who likes to dine on the more adventurous side. It also offers a wide selection of meatless dishes to satisfy the vegetarian palate. Reservations are recommended. 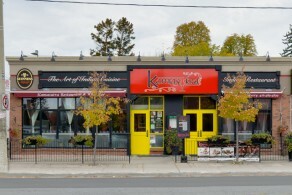 Kamasutra takes great pride in their one-of-a-kind restaurant. The elegant dining area features deep red walls, hand-crafted artwork, contemporary light fixtures, a fully licensed bar, and the tantalizing fragrance of Indian spices. The menu features many original recipes for the carnivore and vegetarian alike. Perfectly complementing these flavors is an extensive selection of world wines, champagnes and eight beers on tap. Kamasutra's easy, contemporary take on tradition has hooked countless patrons. Duff's Buffalo wings are famous for a reason. They're made fresh, not frozen, crisp and crunchy not rubbery. The atmosphere is busy, at times loud, but that's what happens when you make the best wings in town. 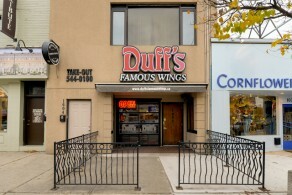 Duff's infamous Tuesday Night Wing Special (10 wings for $7.25) has undoubtedly worked its way into many a Leaside household's routine. The Bayview location is much larger than its sister spot on College and often much much busier.